He perches his small, solid body atop my lap, a songbird newly gifted with lyrical song. Lips press against my flushed cheeks before he sings a few notes to the thoughts I’m sure have been swirling and lingering in his mind for weeks stretched out into months. Maiii mommmeeee, he exclaims with passion. Cars? he asks and zooms one across a long stretch of highway, covering the skin from my fingers to my shoulder. His music in my melody-starved ears drowns the noise of chaos and busy, schedules and to-do lists, musts and wants. In this time-space continuum, I am the song-entranced fan in his opera of life. 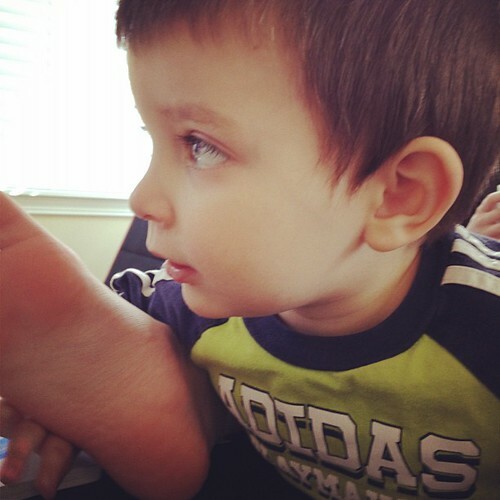 His hands navigate a blue Hotwheels convertible across my legs, and I’m reminded that before there were words, there were signs conducted rhythmically by chubby baby-turned-toddler hands, telling me the story of please or more or want. And before there were hands moving to the beat of desire and need, there were the bluest of eyes, oceans of emotion deep swelling with cadences of life-love beneath the longest of dark lashes. His baby blues have forever been singing me stories while his baby body was pressed tightly, heart-to-heart against my chest, following me through the day’s tasks of laundry and play and dishes and dinner. I linger in the swelling of sweet-song-sung-past before he’s up and singing another verse, this one laced with lyrics both known and unknown. I am thankful for all of the melody and harmony sung in the native tongue of mother-baby love as well as the crescendo of lyrics giving language to a new scene. We made a big announcement over at Bigger Picture Blogs today, and it's very near and dear to my heart! In an effort to grow our skill as writers and foster creativity, we're rolling out a brand-new program called Writing Cirlces! It's virtual, it's free, and it's been amazing. This piece above was written after being inspired by a prompt from one of our Writing Circles sessions. It was then read aloud to the group, praised and critiqued and finally edited before being published. 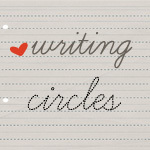 Want in on the next Writing Circle? Be sure to check it out!